Popular for both work and play in the shallow waters of southern New England, Long Island, and New Jersey, the catboat was developed before 1850. Its characteristic feature is a single mast set at the very bow, with one large sail. Catboats usually have wide, shallow hulls as well, often with a centerboard to help them sail straight in spite of their shallow draft. Selected from the many examples in the Museum’s watercraft collection, this exhibit shows the variety of traditional catboats. The 12-foot Beetle Cat is a pleasure boat first built at New Bedford, Massachusetts, in 1921 and still in production today. During the summer you can see Beetle Cats under sail, and even try one, at the Museum’s Boathouse. Sanshee is a 14-foot Cape Cod-type catboat built at Wareham, Massachusetts, for pleasure use before 1925. Other cat-rigged pleasure craft are the 14-foot North Haven Dinghy, a type that has been raced in Maine since 1887, and the 13-foot Woods Hole Spritsail Boat, built for racing at Woods Hole on Cape Cod about 1914. Working catboats in the exhibit include the Newport shore boat, built for fishing and lobstering in Rhode Island around 1860, and the classic 20-foot Crosby catboat Frances, built at Osterville in 1900 and used for many years at Nantucket. Also on display are three examples of the exceptional yacht design and construction of the Herreshoff Manufacturing Company of Bristol, Rhode Island. Fiddler, a Buzzards Bay 15 class racing sloop with typically long ends, was built about 1902 and owned by Caroline Dabney, who won the 1904 Beverly Yacht Club series with her all-female crew. Her family donated the boat to Mystic Seaport in 1959. With her short ends, the 26-foot Alerion III, built in 1913, is a contrast to Fiddler. Alerion was a favorite of her famous designer, Nathanael Greene Herreshoff. 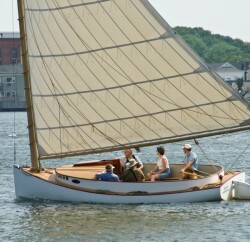 He used this beautifully simple daysailer in Narragansett Bay and at Bermuda. Alerion was donated to Mystic Seaport in 1964. Nettle, a Buzzards Bay 12 ½-foot-class daysailer, is one of the popular class designed by Herreshoff in 1914. The fiberglass version called the Bullseye is still racing today. Catherine Adams received Nettle as a Christmas present from her father, Charles Francis Adams. Almost 50 years later, after she, her children, and her grandchildren had learned to sail in Nettle, she donated the boat to Mystic Seaport in 1963.